Summary Cloud-based conferencing solution aimed at non-technical users with limited feature set. Pros • Easy to get started with. • No addon installation (other than Flash) required. Cloud-hosted video conferencing options are plentiful, from big players like Cisco and Citrix, to newer entrants like Nefsis. iMeet is a new product from Premiere Global Services (PGi) a $600M Atlanta-based provider of web-based business conferencing services. PGi can put together web conferencing services using Adobe Connect, Cisco WebEx, Microsoft Live Meeting and IBM Lotus Sametime. In addition to iMeet, PGi also offers GlobalMeet.com, which appears to be aimed at business users. While Nefsis' goal is to produce the highest quality video conferencing, primarily for business use, iMeet is aimed at consumers and wants to be the easiest to use. Let's see what iMeet can do. iMeet provides a 30-day trial to anyone interested in the service. Users interested in paying for the service will be charged $69 a month. This is relatively cheap compared to larger players like Webex or GoToMeeting. But those services also offer more. For the price, you get a number of interesting features. First off is that iMeet is "client-free", running in any web browser supporting Adobe Flash. There's an optional room monitor you can download and install, which notifies you when people join your room. iMeet requires Flash 10.1 (10.2 in Chrome), so users might need to upgrade to fully use the service. The room monitor / notifier runs as an Adobe Air application, so you'll need that installed, too. iMeet uses a concept of "cubes". Each meeting participant is placed into a "cube" that handles the audio and video options for that person. The rooms support up to 15 guests (for 16 people total) and have several unique features. If you email an attachment, it will show up in your room. All rooms also get a special shortened URL to use for inviting participants. Hosts can also add web pages to show to users, which mostly serve as a jumping-off point. Videos can be added as long as they come from YouTube. Files can be "showed", but like web pages aren't truely presented. iMeet also does not have support for Powerpoint presentations, so you can't host a true webinar like other services. No virtual whiteboard integration is present either, and you can't share your desktop. The last item is most likely due to the reliance on Flash. Signing up for a 30-day trial was as simple as creating an account. During the process you may choose to download the meeting room notifier. As noted above, this runs on Adobe Air, so both Windows and Mac OS X are supported and have the same experience. 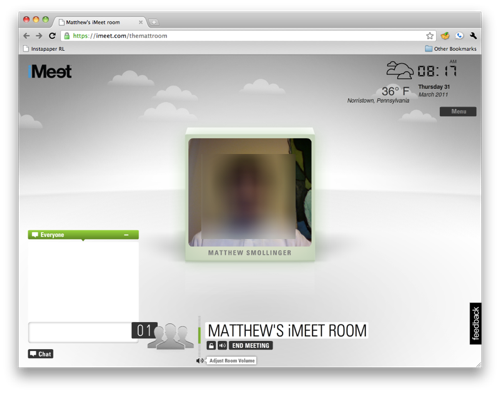 When signing into your account the first time, iMeet will have you create your room. The room gets a unique URL, and email address, based on the name you enter. Try to keep the name simple so you and your guests can remember it. Then you can log into the room. Room login was painless on Windows. My Mac had to have the page refreshed to get it to go past the loading indicator, but that only happened once. Once in the meeting room, you are prompted to either call in, have the service call the phone you listed in your account, or have the computer audio used. I opted for the computer audio. This will open the Flash preferences panel, where you have to decide if you want iMeet to access your video. This was slightly technical for an end-user, so points off from iMeet for not explaining that process first. Once I had set that up, turning on voice and video was just a matter of selecting which audio input and which camera to use. Chrome users will have multiple selects if you've installed Google's Voice and Video plugin. Just pick the most sensible one. The basic room layout. Look at the cute icons! The chatbox can be global or to individual guests. Files can be added here, along with videos. Sending files via email is a nice feature. Adding video is a Youtube link affair. No regular video files for playback. Video playback was decent, but lacked any kind of controls. Video quality was subpar, even with just myself in the room. I averaged 5-15 FPS and the quality was mediocre (like when YouTube first launched kind of mediocre). Files and videos worked fine, and displayed correctly. You can't control the video like you can in Nefsis though. So being able to convince users to stop watching so you can talk might be a bit unnerving. Audio quality was horrendous. I've used other Flash-based audio products before, and this was just awful. Both Tim and I used our webcam microphones, which we use almost daily to talk over Skype. Skype's audio quality, which I consider mediocre at best, is like listening to a CD compared to iMeet. Echo cancellation doesn't appear to be used, since Tim heard it from my MacBook's closely-spaced mic and speaker. Access is web only. But I'd wager that there are mobile clients on the way. Mobile client development will likely require more time due to iMeet's dependence on Flash, which doesn't currently operate on any mobile device the way iMeet would need it to. Support is email only, with some guides, FAQs, and video tutorials online. I have a thing against video tutorials, as they don't allow me to easily move at my own pace (usually slower than the knowledgeable presenters). But for many people video tutorials work just fine. Security is mostly unexplained, other than to say everything is SSL'd. iMeet does not document how files are stored, so assume the worst and don't put anything up there you'd consider even mildly sensitive. In closing, iMeet might be ok for very basic web-based conferencing. But it lacks too many features essential for business use. Not having support for true Powerpoint presentations means many potential users are going to just pass it over. And no virtual whiteboard also cuts down on collaboration capabilities. The social media features, which I didn't even bother to mention in the Feature section, don't really add any value. Everything iMeet lets you do you on the social websites can be done elsewhere, without tying yet another service into your social data stream. The lack of security documentation means anyone with an eye for security won't use the service. So, if the lack of key features, unhelpful social media features, mediocre video and bad audio aren't enough to dissuade you, then feel free to try out the product. Or instead of $69 a month, you might try a free trial of PGi's GlobalMeet for $39 a month. Come to think of it, I probably should, too.